Yannick studied for six years at the prestigious Parisian arts and crafts school, the Ecole Boulle. His education included training in traditional and modern cabinetmaking, design, marquetry and engraving. Yannick’s work combines the best of his traditional training in the tried and tested methods of the past with his interest in technological advancement and experimentation. 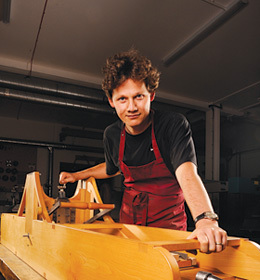 The history of techniques and materials of cabinetmaking fascinate him. His conservation work has allowed him privileged intimate access to masterpieces by eighteenth, nineteenth and twentieth century makers, including pieces by Boulle, Riesener, Oeben, Linke and Ruhlmann. Dismantling and examining minutely these treasures of the past still gives Yannick frissons of excitement. Yannick moved from France to England in 1997, exchanging the Louvre for the Wallace Collection in London, before setting up on his own. His fluency in both languages allows him to assimilate ideas, history and expertise from France, Great Britain and America. He has more than twenty years of experience in making furniture and in conservation/restoration. He is a world leader in marquetry making and conservation but also designs, makes and conserves all styles of furniture, with the help of a small, highly qualified and experienced team of craftsmen and women. He has taught all over the world and also offers courses in his workshop in Kent. Yannick can supply specialist tools and materials for marquetry, including the best animal glue available today.